Keeping Afghanistan's roads free of improvised explosive devices is no easy feat when important routes are re-mined within hours of EOD teams clearing them. That's why US Army has deployed the Buffalo: a six-wheeled, 38-ton, armor-plated supertruck designed to demolish roadside bombs with abandon. The Buffalo, built by Force Protection, is classified as a mine-protected clearance vehicle (MPCV) and is based on South Africa's Casspir APC (armored personnel carrier). It measures 27 feet long, 13 feet tall, and nine feet wide, and it has room for six. It's outfitted with a 440 HP CAT C13 12.5l engine that provides a 55 MPH top speed while the 85 gallon fuel tank delivers a range of 300 miles. Like its namesake, the Buffalo MPCV is built tough. The vehicle is wrapped in layers of BAE Systems L-ROD aluminium armor and has a V-shaped undercarriage that directs IED blasts outwards from the centerline, away from the crew. All six of its steel wheels are equipped with Michelin 16 R 20 XZL aluminium-rim run-flat tires. In all, the Buffalo can shrug off small arms fire (up to NATO 7.62) and RPGs from the sides and top as well as withstand up to a 45-pound landmine to its wheels and 30 pounds of explosives to its underbelly. Of course, the route clearance engineers would prefer to dispose of IEDs before they're sitting on top of them. That's why these vehicles are also equipped with a 30-foot robotic claw arm (complete with attached camera, sensor suite, and iron manipulator). In addition, the Buffalo can lower a set of disc rollers like a steamroller to run over and detonate bombs planted in the roadway. 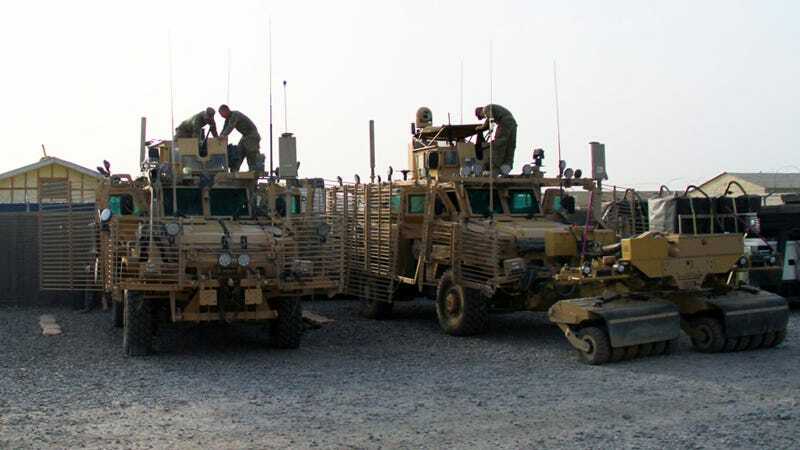 The US Army Corps of Engineers deployed its first Buffalo to Afghanistan in 2003 for use in demining, route clearance, and convoy protection operations. Five years later, that number had swollen to 200 as the vehicles proved their usefulness and reliability. Many other European and Asian nations, such as the Italians above, have adopted them as well. "There are no RCPs [route clearance procedures] that are 100 percent," said Sgt. Daniel Martin, a heavy equipment operator in 535th Engineering Support Company, to the Army Times. "It what's working the best and when the enemy changes we have to change our tactics, techniques and procedures (TTPs)."